Why ambient? A math teaching style that’s whole and all encompassing, with themes that repeat many times through the years, is most likely to be effective and successful. Today’s post will focus on form drawing and the Common Core Math Geometry Standard #2, which will appear in blue, followed by its ambient counterpart. Since the child is newly over the threshold of formal learning at 7, concrete rather than abstract concepts are most desirable, and it’s fair to say here that the form drawing curriculum is covert rather than overt, as befits geometry in its truest sense. All of the two-dimensional shapes mentioned above are well-covered with form drawing, and the circle is regularly divided into equal parts that represent halves, quarters, eighths, tenths, twelfths, etc. 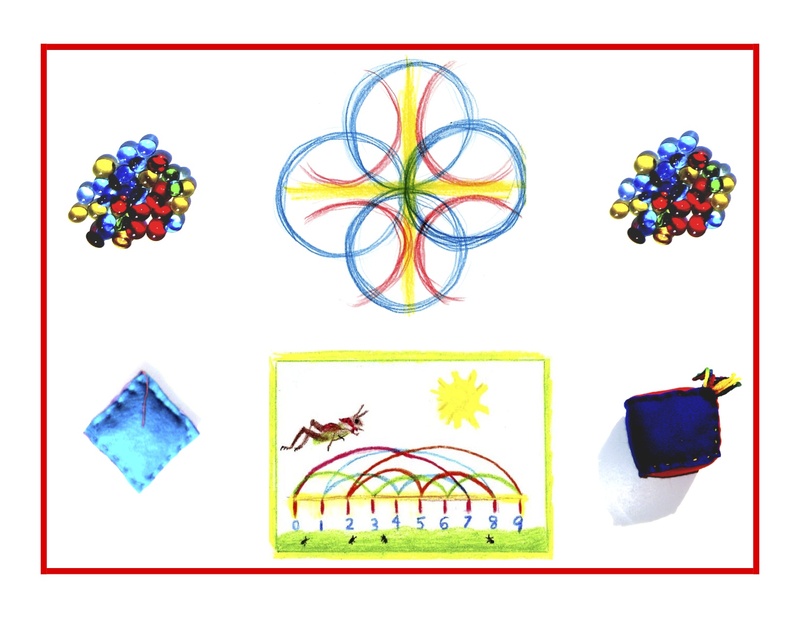 Because geometry is so complex and deeply rooted in all of being and nature, the teaching approach needs to reflect that, especially at this age. Choosing a shape on a worksheet does not fill this bill, not nearly as well as working with the more subtle forms found in form drawing. Experiential learning is so key at this age. There’s a footnote re this standard: Students do not need to learn more formal names such as “right rectangular prism.” You might take this a step further and say that students do not need to formalize any of these terms yet, but rather get to know the shapes and their differences in a fun, friendly format. Some of the activities suggested for Kindergarten could be transposed to the Grade 1 circle time, for a more experiential, movement-oriented, hands-on approach. For instance, as suggested in the Day 18 post, either wooden or fabric three-dimensional shapes can be passed or tossed from hand to hand in the circle to gain a familiarity with their volume and perspectives when held at different angles. To get a sense for the prismatic aspect of the cube, rectangle, cone, and cylinder, see-through objects work well. Search online for clear plastic geometry models, and add them to your shapes collection. (Some of these models can be used later on for exploring volume as well.) Put two or more of these models together to form other shapes (as in 2 cubes together make a rectangular prism). I must say that I was able to much more easily align the Math By Hand materials, activities, and lesson plans with the California State and National Math Standards. Perhaps the intention of the Common Core to be more rigorous has created significant challenges with implementing it. Standards and testing have long been perceived by some as tangential to true learning. This seems especially true of alternative educational systems, many homeschoolers, and most unschoolers. My personal take in creating Math By Hand was that when used properly, the standards can provide the bones of a good education, that are then fleshed out and brought to life with good teaching. I don’t get this sense from the Common Core Standards. They are simply not as user-friendly, accessible, or holistic, but rather seem to be a reflection of the times in their focus on the parts over the whole. I have found volumes and volumes of material online re lesson plans for the Common Core, but none of it rings quite true. When I was a Waldorf classroom teacher, the preparation time was daunting since no worksheets or textbooks are used, and ideally the teacher follows the class through the grades. In order to keep things in balance, I needed to modify the time spent on prep. I’m afraid that so many prep hours are needed with Common Core that teachers are shortchanging the above mentioned “fleshing out” part of teaching. As I have now tonight put in too much time on this post! Yes, balance seems key, as does allowing knowledge to ensue rather than be so diligently pursued. Remember, true knowledge ensues in an environment dedicated to imaginative, creative knowing, where student and teacher alike surrender to the ensuing of that knowledge as a worthy goal. Tune in tomorrow for more Grade 1 form drawing and geometry!